The Perisphera O is the perfect probe to use with your electronic pelvic floor exerciser if you are looking for undifferentiated, simultaneous stimulation of your pelvic floor muscles. The spherical gold plated metalised electrodes offer a fantastic large surface area to activate the pelvic floor muscles. With its brilliant shape and size, the Perisphera O is easy to use, by patient or professional, and is great for people who prefer to lie down during their exercises. Perisphera O is perfect for beginners as its spherical shape can be used in all directions to effectively exercise the pelvic floor muscles. It has been specially designed to ensure comfortable use of the vaginal probe while inserting and using. The Perisphera probe is made entirely from biocompatible plastic material. 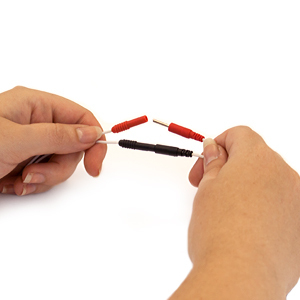 Each Perisphera perineal probe is compatible with EMG biofeedback or EMS machines using two or four wires with a 2mm female banana ending. Probes are provided in a sealed bag with instructions. The Perisphera probe can be used with electronic pelvic floor exercisers such as the Kegel8 or Neurotrac. The Perisphera O must not be sterilised or autoclaved. It must be cleaned with mild soapy water after each use. It is a CE mark Medical device Class 2a. Perisphera probes are all Kegel8 approved and because we trust the quality of our probes so much we extend the warranty from the standard 60 uses up to 6 months unlimited usage.